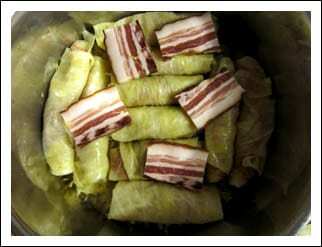 Sarma is a typical recipe from the Croatian cuisine. 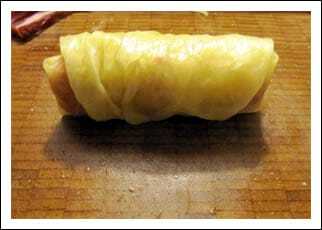 A typical dish that we found as well in the other countries of the Balkans. 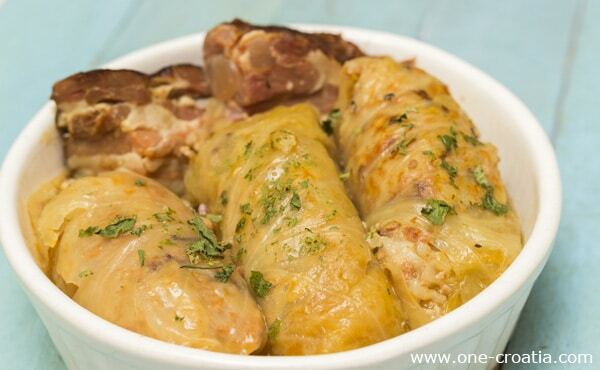 To sum up, Sarma is our best friend during the cold days (and the rest of the year …). 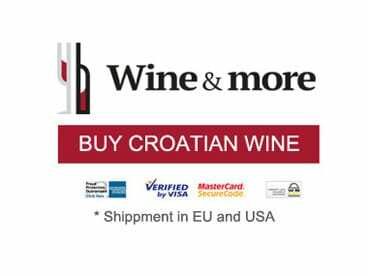 * In Croatian cuisine when we talk about beef we actually use heifer meat. A heifer is how we call a young cow before she had her first calf. The meat is better quality. 1. All the ingredients are here, let’s start. Ok you got me! The rice isn’t there… Please let me apologize but it didn’t want to be on the picture. Still do not forget it! 2. Gently take out each leaf from the cabbage, be careful not to break them. Each leaf has a thick central stem that has to be thinned so that we can later be fold it and wrap it..
3. 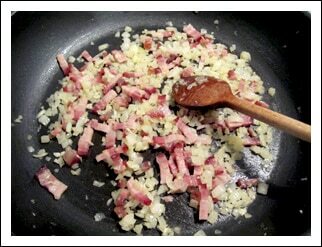 Fry the chopped onion in a little bit of oil until it gets soft (not brown). 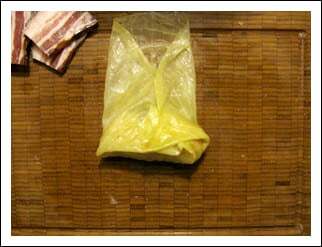 Add the bacon and fry for a few more minutes. Add the garlic and let it fry for just a minute, we don’t want it to get burned. 4. 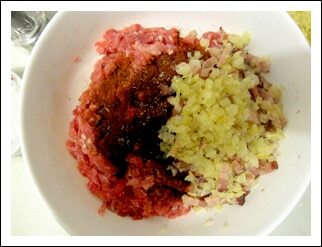 Add to the meat the onions, bacon, garlic, sweet paprika, salt and pepper and the rice (still not on the picture…). 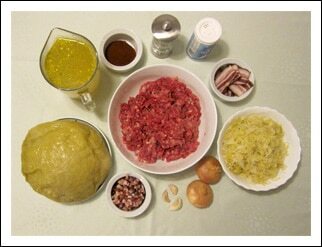 Mix together with your hands until each ingredient get well incorporated to the meat. 5. 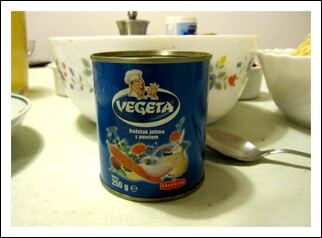 Vegeta is the secret of Croatian cuisine. Its an habit to add one spoon in the meal you prepare. Maybe the habit is getting lost by the new generation (I am not actually totally sure of that), but older woman are use to cook with it. Its a flavor enhancer made from different vegetables and salt. So for this recipe let’s add one table spoon to our meat. 6. Let’s prepare the sarmas. 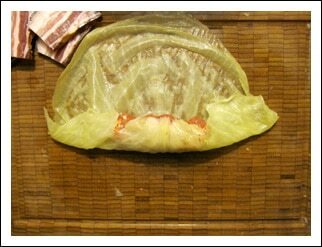 Place a cabbage leaf on a plate. 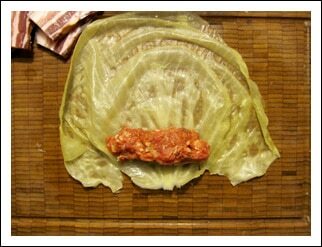 Put a tablespoon of the meat mix on the leaf. 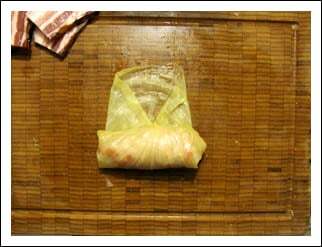 Make sure that the inside part of the leaf is facing you, so it will be easier to roll the leaf without breaking. 7. Start to roll the leaf as you can see on the picture. 9. Then continue to roll to the end. 11. 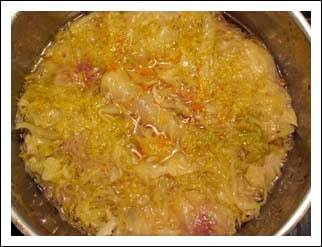 Place half of the shredded cabbage in the bottom of a big pan then place the sarmas on it. 12. Once you have done a row of sarmas, place the smoked meat of your choice (bacon, sausage…). 13. Continue to fill up the pan with sarmas. 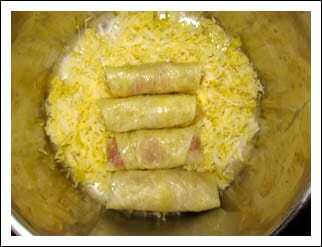 Use all of them and place the other half of the shredded cabbage on the top. 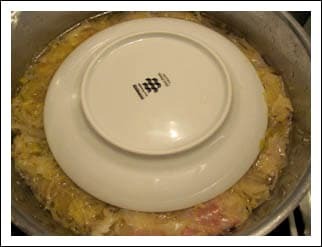 Then pour chicken broth to the top. 14. Place a plate on the top of the sarmas, it will help them not to open during cooking. 15. Bring to a boil, then turn the heat down and let it cook slowly for about 2 hours. Switch off the heat and wait until next day. Yes this is the hardest part of the recipe, sarmas are better the next day so you will just have to wait… The next day (finally), bring to a boil to warm them up. While they are warming up put 3 tablespoons of oil in a pan on a low heat, add 2 tablespoons of flour and mix for a few minutes until it gets a light brown color. Add 2 tablespoons of paprika and 2 dcl of cold water stirring constantly with a whisk. Bring to a boil and pour in the pan with the sarmas. Cook all together for about 10 minutes. 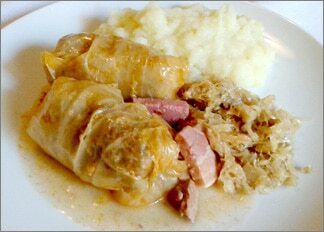 Sarmas are now ready to be served, with mashed potatoes as we usually serve them in Croatia.